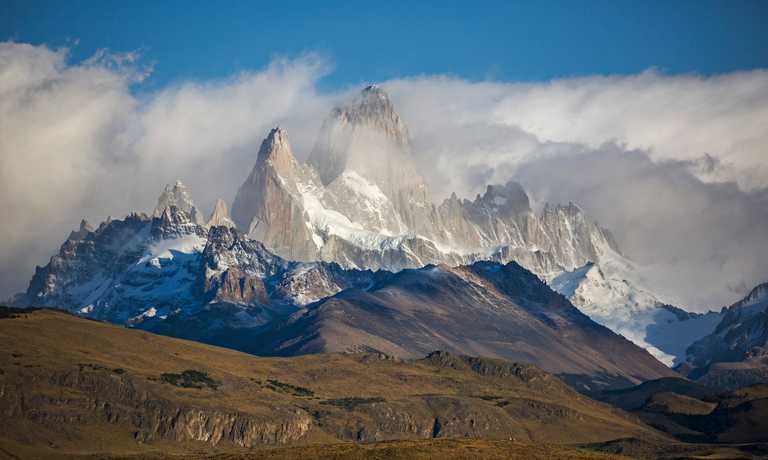 Trek between two historic estancias through the uninhabited wilderness of Los Glaciares National Park. 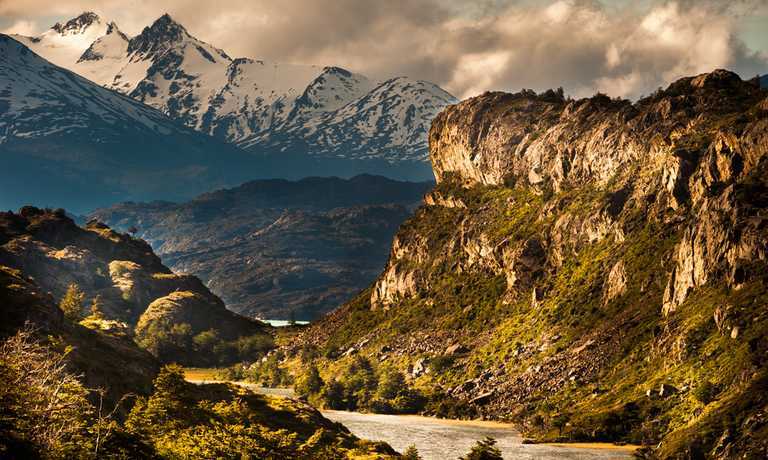 Enjoy incredible views of Viedma and Argentino lakes as well as Upsala Glacier. This is a truly remote expedition that can only be done in small groups due to its exclusivity. You'll take a private ground transportation from El Calafate or El Chalten depending on the initial point of departure. The road is part paved and part gravel going for around 180 km with beautiful views of the lakes and typical Patagonic steppe. Once you arrive, you can leave your luggage in the designated rooms and have some relaxing time to enjoy the place. You'll have the option to do a short trek to Laguna Azul returning to the Estancia to have a typical Argentinean dinner. After having breakfast, you start from Estancia Helsingfors and trek to Seno Moyano. You will hike till the end of Seno Moyano going through Boj hill and Private Reserve Mascarello. The trail goes along the Viedma lake shore having fantastic views of Aterrizaje glacier and Campana hill. You'll trek through one of the less visited areas of the National Park. There will be thick vegetation throughout this trail until you reach the Seno Moyano area where you'll set up your first campsite. Starting from Seno Moyano you'll start walking till you reach Meson hill's col after 3 hours. You continue hiking without losing height till you reach a mountain pass that divides Moyano's valley and North Canon. From here, you'll have beautiful views of Moyano hill (2370 m), its valley and North hill (2316 m) as well. After reaching this pass you walk downhill for an hour till you reach the North valley where you'll set up your second campsite. The whole trail follows an old burn forest with spectacular views of the surrounding mountain range. This is one of the most attractive days of the program. During this day, you'll walk through a glacier valley till a high pass that will take you to Canadon Norte (North Canon). From this pass, you'll have views of the whole Mascarello Natural Reserve's massif, Norte and Moyano hills including the North canon descending through a long trail that ends at Laguna Anita (formerly Pearson). Then you walk in the shadow of the Norte and Moyano cliff faces, descending around 200 meters along moraines and washed stones. You continue towards a zone of swamps and low forest trees till you finally reach two beautiful lagoons at the bottom of Norte hill. Right here, you'll set up your campsite with incredible views of the lakes and glaciers around. Today, you'll have breathtaking views of this inhabited area of the park. You'll trek downhill around 400 metres through a valley following wild animal's footprints towards the right side of a river. After passing through the forest you'll continue uphill till you reach the valley ridge near Musters hill, before setting up your last campsite close Anita lagoon. You'll enjoy your last dinner surrounded by spectacular views of Murallon (2748 m) and Cono (2370 m) hills with its hanging glaciers, Bertacci and Agassis glaciers joining uphill with Upsala glacier. At the end of the valley you can also see Estancia Cristina, Argentino Lake and the Fosile's Canon. Your last day will be more relaxed, crossing a valley ridge descending to the bottom of plain green valley which is located near Estancia Cristina. Once you arrive and after having lunch you take a boat that departs in the evening. You'll navigate through the Argentino Lake to finally reach Punta Bandera port. From here you'll take a ground transportation back to El Calafate ending our program. This trip can run as a group trip, with prices starting from $2,490 per person for a complete group. If you are looking to join a group or you are a solo traveller we will help to form likeminded groups of travellers. Please let us know your travel plans. The price of $2,490 per person is indicative based on a group of 2 people. The price of $2,370 per person is for a group of 3 people and the price of $2,175 per person is for a group of 4 people. Additional supplement required for solo travellers requiring a single room at Estancia Helsingford and El Calafate.